Since nobody took home the grand prize in Saturday's Powerball lottery, Wednesday's jackpot total is now at an estimated $1.3 BILLION, more than doubling the previous record! That means that there are a LOT of people out there right now fantasizing about becoming overnight billionaires...and just what they would spend all that money on! 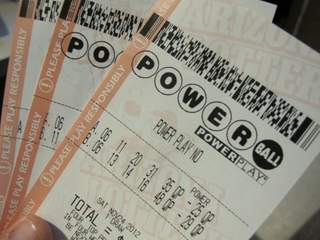 Even the paranormal community is not immune to this Powerball Fever, and plenty of paranormal investigators, researchers, and enthusiasts are eagerly planning on all the spooky things that can be accomplished with lottery winnings that massive. Admittedly, I am one of them, lol. If I won the lottery, I'd obviously take care of first things first. I would make sure that my family was taken care of with new homes, cars, and anything else they needed/wanted, all debts paid off, and substantial trust funds set up for my son and nephew. I'd probably also go back to school and there are several charities that I would like to give generously to. But then...the fun stuff! The main paranormal dream I have is to actually purchase my OWN haunted property. I want something pretty big, such as a hospital, hotel, prison or even a school. I don't want to keep it all to myself, though---I want to create an all-inclusive center for paranormal education and research! I want a location where investigations can occur over a period of time in as a controlled environment as possible. HPIR would obviously be the 'in-house' group, but the facility would be open to other select teams and individuals, with the occasional public investigation event as well. It would be a place of research, where experiments can take place, again in as a controlled environment as possible and repeated over a period of time. It would be a place where new technologies and new techniques can be explored and tested. It would also be a place of historic and academic research. My personal paranormal and West Virginia history libraries are growing unwieldy. I would love to turn a section of my own haunted facility into an expansive lending library and research center. My collection would serve as the basis for the library, but I'd definitely use a huge chunk of those lottery winnings to expand. And lastly, my haunted location would serve as an educational facility. I want to host a huge array of speakers and presenters for regular lectures and workshops. I want to offer a variety of classes on anything and everything that would be of interest to a paranormal investigator. Classes could be attended live and in person, or via online. Anyway, that's a quick breakdown of what I would do if I won this week's unprecedented Powerball lottery jackpot. Hop over to Theresa's Haunted History Facebook and let us know what YOU would do if you won!